The Golden Cluster is an area of outstanding heritage focused on Middleton, Greater Manchester. They are vivid reminders of the area’s fascinating history and the outstanding people who came from there, figures such as Cardinal Thomas Langley, Julia Schwabe, Ashton Lever, Samuel Bamford and Lydia Becker. Capping it all off, is the Arts & Crafts heritage of Edgar Wood, the pioneer of art deco architecture. 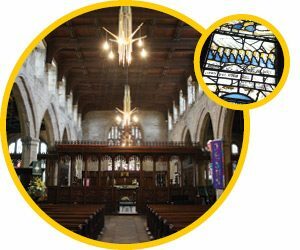 Grade I listed medieval church with 500 years of art, craft, furniture and stained glass. St Leonard’s is Manchester’s oldest and most interesting church. It has many beautiful and interesting features including, the famous Cardinal Langley Porch of 1412, brasses, stained glass windows, misericords, medieval rood screen, a rare Norman-Gothic arch, unique wooden bell tower and famous Flodden stained glass window – the oldest glazed war memorial in the UK. Grade II* listed building and unique rambling picturesque black & white pub. 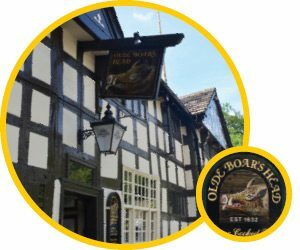 The oldest pub in England, the “Old Boar” is timber-framed inn of 1632 where each oak beam creaks with history and character. After nearly 500 years, it’s still a great place to relax and dine! Grade II* listed church, school and garden. Testament to the genius of Edgar Wood. Middleton architect, Edgar Wood, rose to international fame around 1900. 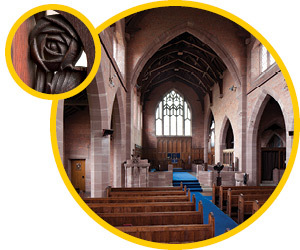 His masterful combination of Art Nouveau and Arts and Crafts styles can be seen throughout the church and adjoining school. There’s also an exhibition about his life and work. Grade II* listed building and oldest surviving Queen Elizabeth Grammar School in the country. Granted letters by Elizabeth I in 1572 and opened in 1586, the school was founded by Alexander Nowell of Brasenose College, Oxford. The building is a combination of medieval and Renaissance styles and is a popular venue for events and parties. A good place to begin is Jubilee Library, opposite Ye Olde Boar’s Head P.H. Built in 1889, it is one of the first public libraries built by the Arts and Crafts Movement. The front and roof are constructed in the ancient manner using pegged oak timber frames but inside it is built with iron girders and reinforced concrete like a cotton mill! 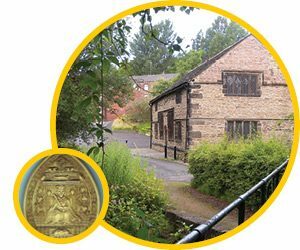 Upstairs, are the Middleton local studies archives where you can have a relaxed browse at the historical material or undertake more detailed study. There are many more historic buildings in the Golden Cluster, including the Samuel Bamford obelisk in the Old Burial Ground, the National School on Long Street and the old Police Station on Market Place. 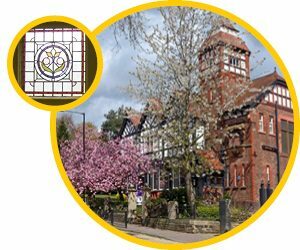 There are also many Edgar Wood designed buildings including Manchester & Salford Bank, Market Place, Redcroft and Fencegate, Rochdale Road and 36 Mellalieu Street. Access by car is excellent with the M60 and M62 providing access from the north, south, east and west. There small car parks close to each building. By bus, catch the 17 bus from Manchester or Rochdale (alight at Jubilee Park/Middleton Library). Middleton Bus Station is also within walking distance. The nearest railway station is Mills Hill, a mile and a half east of Middleton centre. It lies on the Caldervale Line between Manchester and Leeds. The Golden Cluster buildings are within a quarter of a mile of each other. Please note that there are some steep inclines if walking between them. Less than a mile away on Manchester Old Road are Middleton’s Garden of Remembrance, an Arts & Crafts memorial to the fallen of the two World Wars, the unusual triangular 165-167 Manchester Old Road, Edgar Wood’s last houses in Middleton, and Alkrington Hall and Park, designed by Giacomo Leoni, one of the first Palladian mansions of England.